Have You Thought About Cleaning Your Dryer Vent Lately? A restriction in the venting can cause lint to build-up inside the dryer where it is a very real fire hazard! Clean your dryer’s venting at least 1 or 2 times a year to prevent possible fires Please Note! Between 1980-1998 an average of 14,500 fires “per year” are known to have been the result of dryers. Those fires average 13 deaths, 239 injuries and $53.1 million in property damage “per year”. We are afraid the statistics aren’t getting much better and in fact appear to be increasing. 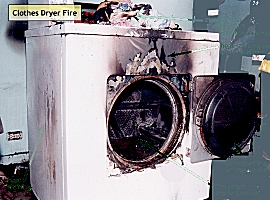 The Consumer Product Safety Commission estimates that over 24,000 clothes dryer fires occur each year now in the USA. There are many things that contribute to the proper operation of a dryer; the venting is perhaps the most critical in the system. Improper installation of your dryer vent system can also create a serious hazard for you and your family. 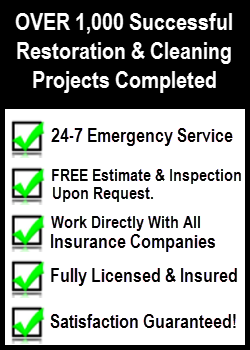 At-AllStates Restoration we provide a professional vent cleaning service that includes cleaning the vent duct with special tools, checking connections. We can even handle those extra long vent ducts, so common these days. In most cases it doesn’t take long, and we leave your laundry room cleaner than we found it. Moisture: One of the most important functions of a dryer is the elimination of moisture recovered during the heating of damp clothing. A typical 12-pound load of laundry can weight as much as 20-pounds or more when first removed from a washer. The extra 8-pounds are water. That moisture is held as humidity in the warm air produced by the dryer and is normally expelled to the outside through the dryer’s vent. If this air can not be adequately removed, poor drying will result. This moisture can also condense into pools of water in the dryer vent, eventually leaking out. 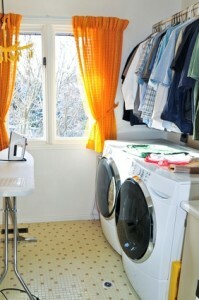 Heat: The heat is another important function of a dryer. Many current dryer models have a ‘one time’, non-resettable, thermal fuse for safety. These safety devices will open should the dryer’s vent not be installed properly or it becomes restricted. Once this happens, the dryer will no longer heat at all and will require the part to be replaced to correct the condition. Are your clothes taking too long to dry? 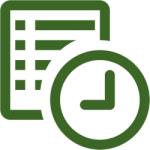 Are your energy bills higher than usual? Birds and dropping may become trapped in you dryer vent causing disease and/or fire. Clogged vents decrease your dryer’s efficiency, increasing drying time therefore increasing your energy bills as much as $45 a month. Increased life of your dryer by better efficiency. Reduced maintenance calls for your dryer. Less wear on clothes from overheating and excessive tumbling. And probably the biggest reason is have peace of mind. Q: How often should a clothes dryer duct be cleaned? A: The clothes dryer duct should be cleaned twice a year. Q: How does my dryer duct get clogged with a lint trap on my dryer? Q: Is this a job for a professional or can I do it my self? A: There is approximately 1 gallon of water vented per batch of clothes causing moisture in the duct. The wet lint particles slowly accumulates over time on the sides of the duct and eventually blocks air from venting or sometimes there can be a mechanical blockage such as a bird nest in the duct. In any case, most dryer manufacturers, recommend that residential dryer duct be cleaned 2 times a year for fire-prevention and energy-saving reasons. To insure the job is done properly and there’s no break in the line causing a much larger problem a professional dryer and air duct cleaning technician should perform the cleaning.